Book Fairies Are Dropping Books On The Delhi Metro. Found One Yet? Look carefully and you might just see a book hidden away somewhere on the Delhi Metro. If you travel by the Delhi Metro and you've seen a sudden abundance of books wedged between the banisters, hidden away in corners of the station or simply left on train seats, you have Books On The Delhi Metro to thank. Books On The Delhi Metro or BODM is an initiative that was started in May by Shruti Sharma and her husband Tarun Chauhan. Very similar in concept to Books On The Move, the BODM community wants to bring back the reading culture by dropping books on the Metro that commuters can pick up, read, and drop again for someone else to pick up and continue the cycle. "The idea came to me when I saw an Instagram post by Emma Watson," says Ms Sharma in a conversation with NDTV, referring to when the actor hid a 100 copies of Margaret Atwood's The Handmaid's Tale in Paris. "I contacted the founder of Books On The Move - Global in May and asked if something similar could be done in Delhi - they agreed." 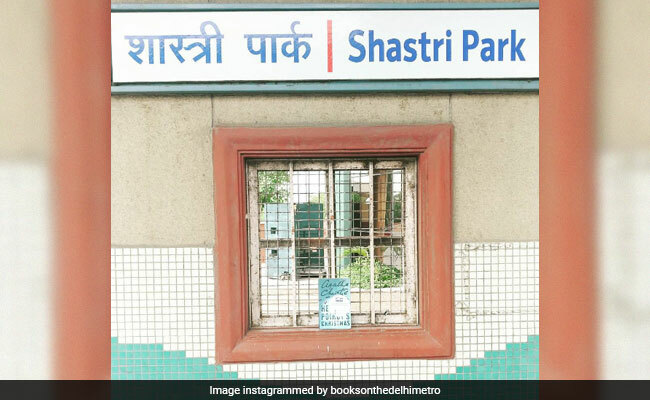 Even though BODM started with just two people - and with Ms Sharma giving books away from her personal collection - it has grown into a community of over 15 'book fairies' or volunteers who drop books on every line of the metro. "The only lines where we haven't expanded to yet are the rapid metros and the airport line," says Ms Sharma. "I'm a newbie book fairy, so I've just dropped one book, but it was a great experience and it also helps break the usual monotony of metro rides," says Isheeta Sharma, a volunteer with BODM, to NDTV. Books On The Delhi Metro drops books on metros every day of the week, except the weekends. So the next time you're travelling by metro, keep your eyes peeled and you might just find a lovely surprise for the book lover in you.